This sunny morning the Bali Cab driver team will pick you up from the hotel with clean and comfortable air-conditioned cars, our tour this morning will explore the beauty of the river in Bali with tubing adventure. For river choices, you can choose according to your abilities, For those of you who are traveling with children, we recommend joining the Pakerisan river or Penet river where that two rivers are still in the safe category for children from 5 years old, for penet river tubing, we only provide single tubing while the river pekerisan you can play tandem tubing, both rivers have a duration of about 1.5 hours. For those of you who like extreme and challenging tubing with a duration of 3 hours, we recommend you to choose the wild Ayung river, you can take tandem tubing to make it safer. After the tubing trip is complete, we will having lunch at tubing restaurant, then tour will continue to Kintamani, a famous village in the Bangli district which is as prime tourist attraction and is the only tourist attraction that can bring great income to the Bangli district government, as we have many visitors come here. This place offers amazing views of the lake Batur and mountain Batur, you will see Mount Batur, which is still active with the color of its black lava, making this place very beautiful, the stretch of Lake Batur which is the widest lake in Bali with a row of hills surrounding ii, make us never bored to enjoy it. The Opposite of lake Batur there is an ancient Balinese village whose name is Teruyan village which has a unique tradition, where one dies in the family, his body will be placed under the Menyan tree, but does not emit odor due to the strength of the tree keep the body without smelt. Our tour program continues driving along the beautiful rural areas and we will stop at Ceking village to see the beautiful rice terrace known as Tegalalang rice terrace which is very crowded by foreign tourists. Our tour will end in the Ubud Center with a visit to Ubud Palace and Ubud Art Market, you can spend your time taking photos and maybe you can hunt for souvenirs sold by traders at the Ubud art market, then return to the hotel accompanied by Our Bali drivers who always ready to entertain you and share stories about Bali. 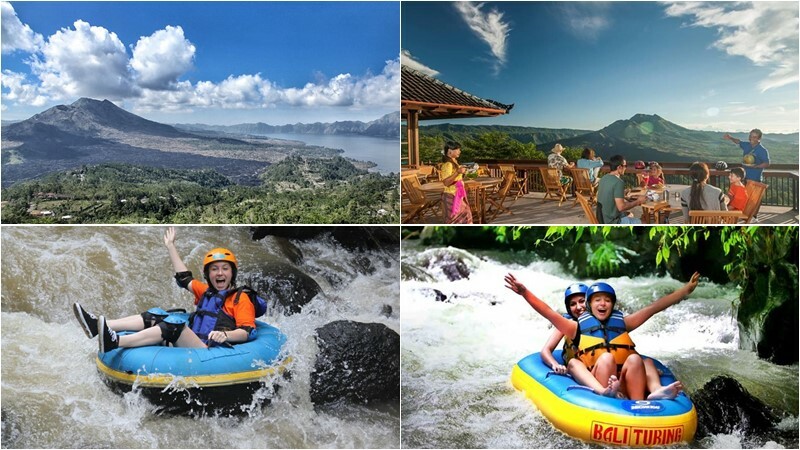 BCD-106: Bali River Tubing + Kintamani Volcano tour. Option 1: Ayung River Tubing + Kintamani Volcano tour. 08.30 – Arrive at Tubing Base Camp, Registered and welcome drink, then transfer to start point. 09.00 – Join on Ayung river Tubing. 12.45 – Enjoy Lunch at Tubing restaurant. 15.00 – Visit Kintamani with Mounta Batur + Lake batur View. 17.00 – Visit Ubud Center with Ubud Palace + Ubud Arts market. Option 2: Pakerisan River Tubing + Kintamani Volcano tour. 09.30 – Arrive at Tubing Base Camp, Registered and welcome drink, then transfer to start point. 10.00 – Join on Pakerisan river Tubing. Option 3: Penet River Tubing + Kintamani Volcano tour. 10.00 – Join on Penet river Tubing. Child can join on Pakerisan or Penet river tubing.